This recipe looks like it has a lot of ingredients, but from start to finish, it only takes 25 minutes. 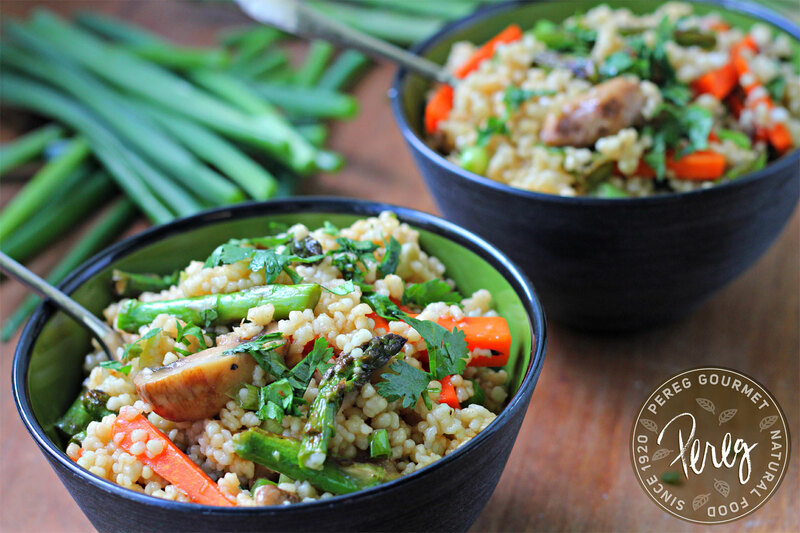 Made with fresh vegetables, spices, and couscous. Made ahead the night before, it also packs well for a healthy lunch option! Place the carrots, mushrooms and asparagus in a large bowl and toss with sesame oil, soy sauce, and black pepper. Let sit for 5 minutes. Heat the grill or grill pan to medium high heat. Put the vegetables on the grill or in a grill basket and grill while basting vegetables with extra marinade. Grill until the vegetables are tender and slightly charred. Set aside to cool. Meanwhile, cook the couscous. Bring the water to a boil and add couscous. Remove from heat, stir, cover, and let sit for 10 minutes until the couscous absorbs the liquid. Drain any extra liquid and cool. When the vegetables are cool, slice the asparagus and carrots into diagonal bite sized pieces and slice the mushrooms. Combine with couscous. To make the dressing, whisk together ginger, 2 teaspoons soy sauce, sesame oil, olive oil, rice vinegar, honey, cayenne pepper and scallions. Dress the couscous and garnish with cilantro. Serve at room temperature. Grilling is one of America’s favorite pastimes and a popular summer activity in backyards across the country. More than 60 percent of American households will cook kabobs, fresh vegetables, and of course meat on propane grills this summer, according to the Propane Education & Research Council (PERC). PERC is an energy check-off program dedicated to safety and training for the propane industry. Willis offers families some simple reminders for preparing and maintaining safe cooking conditions while using propane grills. Before using the grill, he recommends reviewing and following all grill manufacturers’ instructions. Next, the location of the grill is an important consideration. PERC reminds families that the only safe location for any grill—including propane cooking units—is outside in a well-ventilated area and a safe distance from the home. Whether the grill is equipped with an automatic ignition or needs to be lit manually, the manufacturer’s instructions should be followed precisely. PERC also encourages families to keep the top open when lighting the grill. This allows for ventilation and ensures that propane vapors are not being released into the confined grilling area. Finally, proper storage of propane cylinders is an essential safety step when using propane-powered grills. 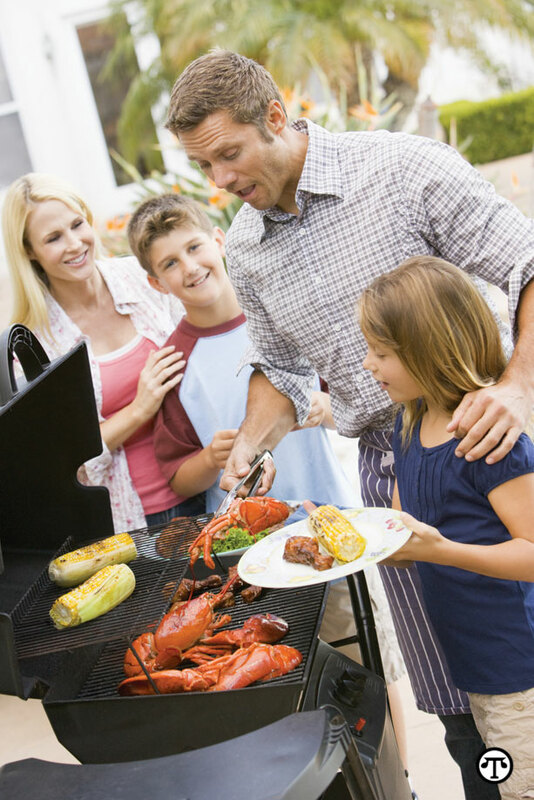 PERC reminds families that propane is a safe fuel when handled properly, and encourages grillers to learn about additional resources on www.usepropane.com. A perfect summer recipe for entertaining! The chicken is brushed with butter and paprika then baked. 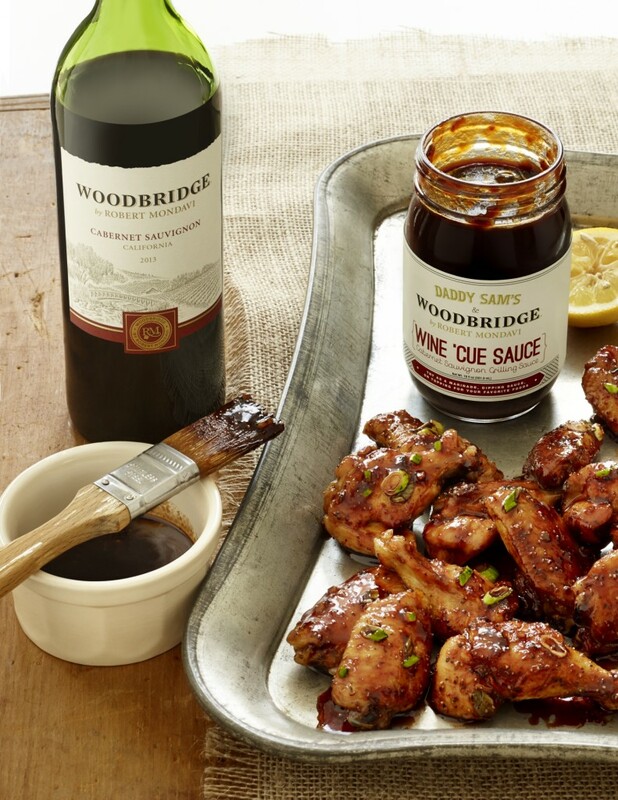 The Woodbridge Wine ‘Cue Sauce is boiled, reduced, tweaked and then used as a glaze over the chicken after it is finished baking. “Mom” uses organic ingredients whenever possible. 2. Make the honey glaze: In a large skillet, reduce the Woodbridge by Robert Mondavi Cabernet Sauvignon over medium heat until there is only about ¼ cup liquid. Pour the wine into a medium bowl to cool. In the same skillet, bring the honey, garlic, dark brown sugar and Woodbridge Wine ‘Cue Sauce to a simmer. When it starts to foam and turn light brown, remove the skillet from the heat and pour in the sherry vinegar. Return the skillet to the heat and allow it to simmer until it becomes like a light glaze, 12-15 minutes. Stir in the black pepper and scallions and pour it over the red wine in the bowl. Whisk to blend. Taste for seasoning. 3. Prepare and cook the chicken wings: Cut each chicken wing at each joint so each wing is cut into 3 parts. You will have 36 pieces including the wing tips. Season them with salt. In a small saucepan, melt the butter and stir in the paprika. Put the wings on a sheet pan and brush them with the melted butter mixture. Bake them for 5-8 minutes. Turn them on their second side and brush with the remaining butter mixture. Then, put the tray under the broiler and cook for an additional 3-5 minutes or until fully cooked. 4. Finish the dish: Toss the chicken wings in the honey red wine glaze and squeeze the lemon juice over them. 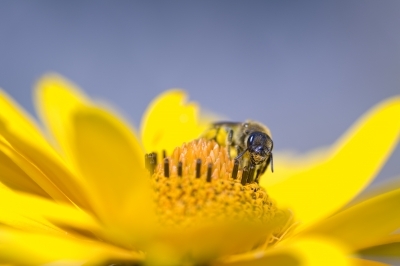 Introducing Sun Cups, An Allergen-Free Treat for All! Allergies are on the rise, but it does not mean you have to give up your favorite treats, such as chocolate peanut butter cups! For oooey gooey chocolate deliciousness, try Sun Cups! 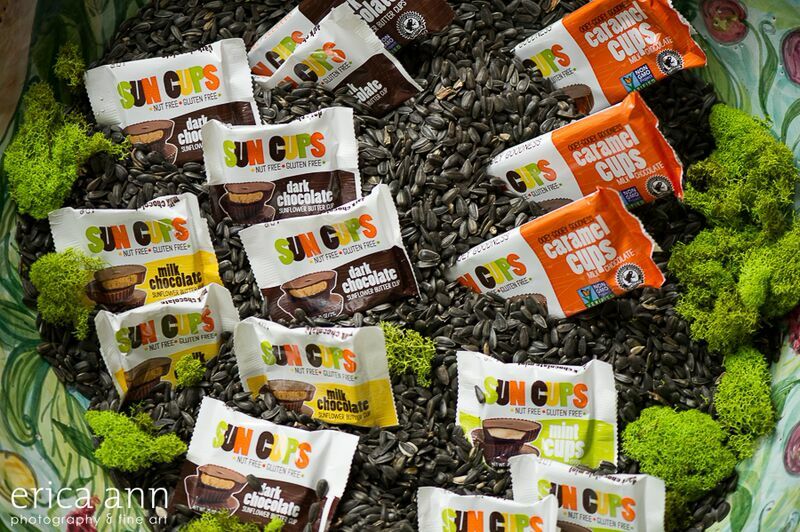 Sun Cups serves as the ultimate guilt-free and allergy friendly chocolate indulgence. Be able to enjoy the delicious creamy & nutty flavors of Sun Cups, except without any peanuts, tree nuts, or gluten! Sun Cups are made from premium cacao of only Rainforest Alliance Certified farms and produced in the only completely nut free facility in America. 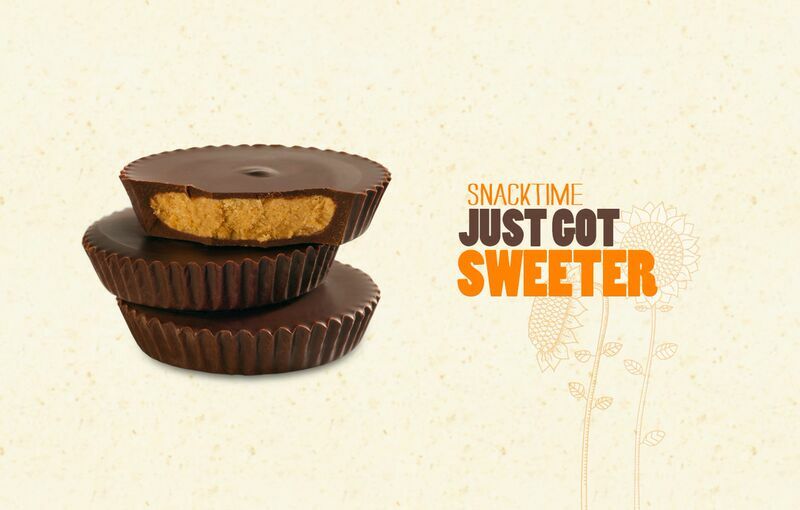 Sun Cups uses sunflower seed butter to replace the usual peanut butter center most chocolate cups have, allowing those with nut allergies to enjoy the classic American treat. Sun Cups offers several different variations to satisfy any sweet tooth, including caramel, mint, and dark chocolate flavors. 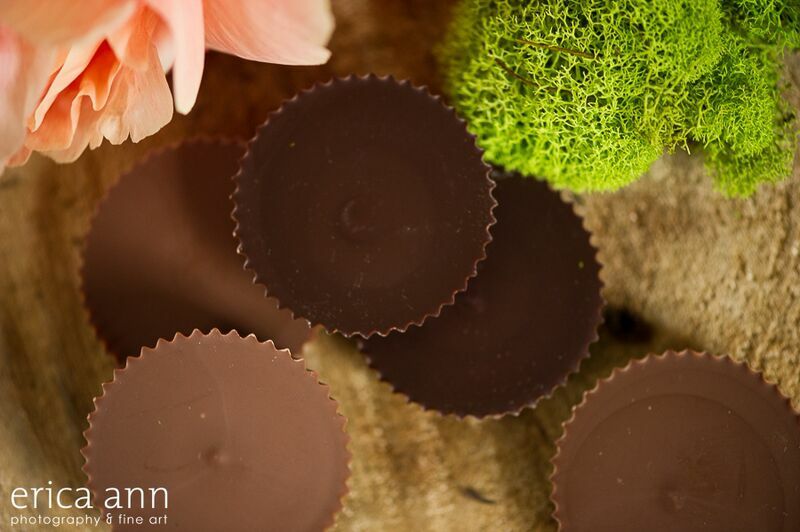 “Mom” loves the rich flavor of Sun Cups, from the traditional chocolate peanut butter flavor to the chocolate mint. Made with non-GMO ingredients, this is one treat you can feel good indulging in this summer! Available in packages of 12 or 24, you can learn more about Sun Cups on their website. 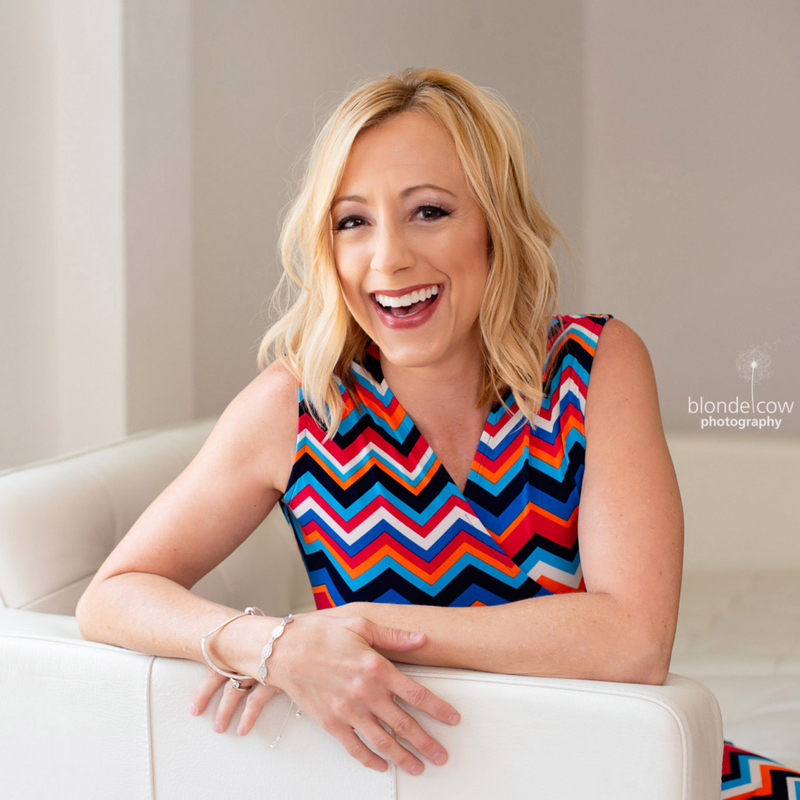 http://tinygreenmom.com/wp-content/uploads/2015/07/Sun-Cups-1.jpg 532 800 Tiny Green Mom http://tinygreenmom.com/wp-content/uploads/2018/07/logo-sm.png Tiny Green Mom2015-07-07 18:57:302015-07-07 18:57:30Introducing Sun Cups, An Allergen-Free Treat for All! When the weather is warm, a cool, crisp ceviche is the perfect dish for an outdoor bbq or dinner party! 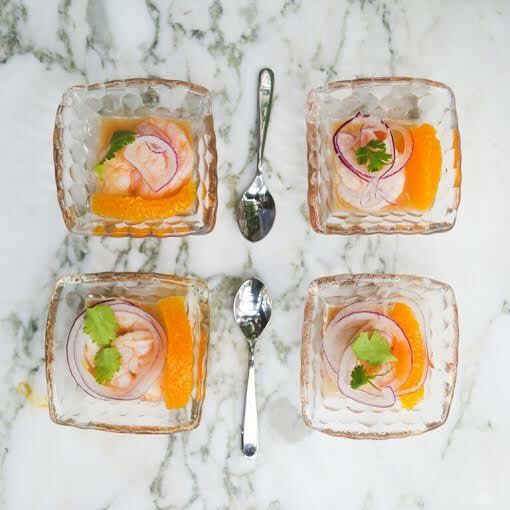 This unique and delicious Orange & Shrimp Ceviche recipe was created by celebrity nutritionist, Tanya Zuckerbrot. The ceviche features ZICO Coconut Water’s newest flavor, ZICO Orange Chilled Juice Blend, which combines the taste of fresh orange juice with all the hydration benefits of coconut water. 2. Line a baking tray with aluminum foil. 3. Place the tomato, jalapenos, bell pepper and onion into a bowl and toss with olive oil. 4. Place the oil covered vegetables onto baking tray cut sides down. 5. Bake for 10 minutes, then stir, then bake for another 10 minutes, or until vegetables are charred. Remove from oven and set aside to cool. 6. Bring a large saucepan of lightly salted water to a boil and add shrimp and blanch for 1-2 minute or until lightly pink. 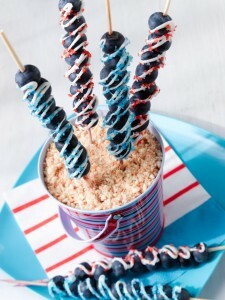 Fourth of July festivities will soon be upon us, and we have found a cute dessert idea that is as fun to make as it is to eat! This looks festive, and is a much healthier option, too!